Only three of the 10 European NATO countries that signed a letter of intent to jointly acquire and operate a fleet of multirole tanker transports two years ago are going ahead with their plans. 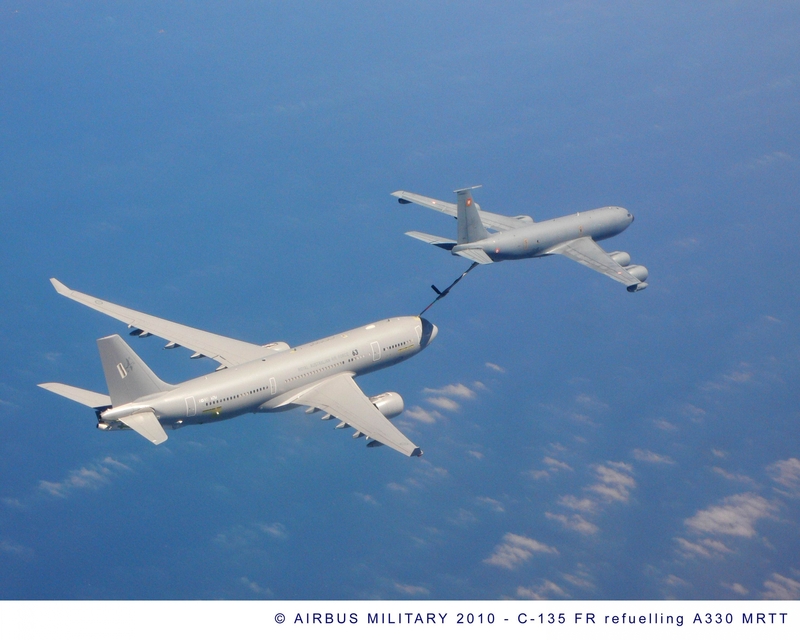 But the European Defence Agency (EDA) has made progress on some other initiatives to boost the air-to-air refueling (AAR) capability of European nations. The Netherlands, Norway and Poland will negotiate with Airbus Defence and Space to acquire a fleet of four or five A330 MRTTs via the multinational OCCAR procurement organization. The fleet will be based at Eindhoven, from where the Dutch air force currently operates two KDC-10 tankers. An initial operating capability is not expected until 2019. The EDA said the three participating nations “would welcome other nations to join the initiative, either before an actual procurement or subsequently.” Belgium, France, Greece, Hungary, Luxembourg, Portugal and Spain also signed the letter of intent in November 2012. France confirmed last month that it would acquire its own fleet of 12 A330MRTTs from 2018. Portugal is a partner with Brazil in the smaller Embraer KC-390 tanker-transport development. The lack of sufficient AAR capability in Europe was exposed during Operation Unified Protector over Libya in 2011. A meeting of chief ministers at the European Council in December last year endorsed AAR as one of four key capabilities that needed to be developed. The A330MRTT is the only off-the-shelf solution that meets the three nations’ key requirements, according to the EDA. The nearest equivalent is the Boeing KC-46A. A spokesman for Boeing confirmed to AIN that the company responded to a request for information (RFI) from the EDA. “If the three nations had chosen the KC-46, maybe they could have bought more tails. But the capabilities are different,” commented Laurent Donnet, the EDA program manager for airlift and AAR. Donnet told AIN that since France and the UK had already chosen the A330MRTT, there were opportunities to share the training and support infrastructure of those two nations. In addition to a multinational fleet, the EDA has promoted three other solutions to the shortfall in European AAR capacity: short-term leasing (including from commercial providers); optimization of existing capabilities; and adapting the A400M airlifter for AAR. Donnet told AIN that there is currently no interest from the nations in short-term leasing, or purchasing commercial AAR service. However, a full proposal from Omega Air is still on the table, and talks with the UK Ministry of Defence are planned for next year on what terms the ‘surge fleet’ of five Royal Air Force A330MRTT Voyager tankers might be available. The EDA has promoted further inter-operability trials with the Italian fleet of four KC-767s. These can now refuel almost all probe-equipped military aircraft in Europe, according to Donnet. The EDA hopes that this tanker will be certified to refuel F-16 fighters from its centerline boom by the end of next March. Three of the A400M partner nations are buying refueling pods for their new airlifters: France (10 pods), Germany (10) and Spain (nine). All A400Ms are built with plumbing and hardpoints that allows AAR from pods under both wings, and from a centerline hose-and-drogue unit that extends from the rear cargo door. Additionally, the EDA has proposed a pool of 50 pods that other nations might use to convert their A400Ms into tankers.